This piece appears to form the foundation of Adbusters Tactical Briefing 18, which gets the basics but misses two important points. 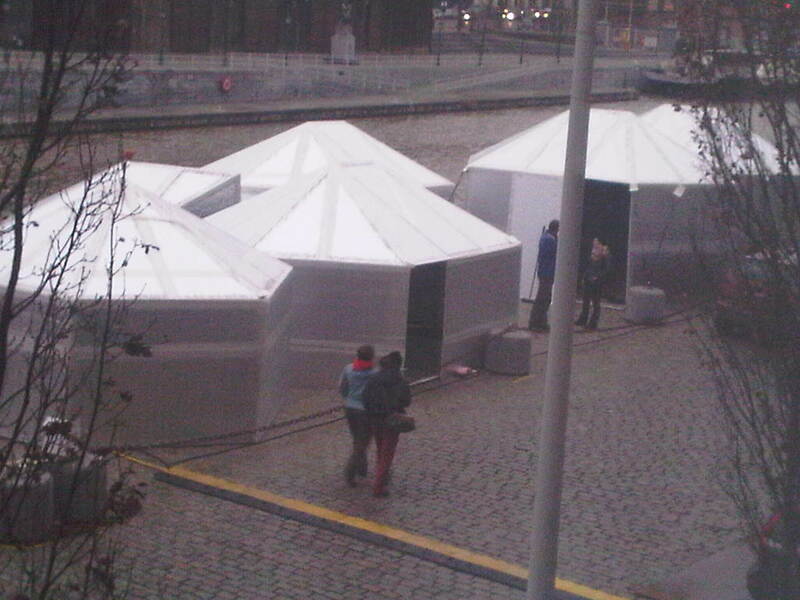 Hexayurt Encampment at Burning Ice, Brussels. Click for video of the winter camp. I’ve been getting a couple of pings a day about providing infrastructural support for #Occupy. I get pinged by email, on twitter, comments, through friends, at events. It’s taken me a while to come to a conclusion, and this post is it. Firstly, let me lay out my political stance: any political solution must solve our problems in a global context, recognizing things like “the 1%” is anybody making more than $34,000 per year.” #Occupy is very limited in perspective, in general, to local economic issues, and lacks (so far) a discourse that speaks to my concerns about global environmental issues and resource geopolitics. So while I’m sympathetic to #Occupy, it doesn’t directly address my concerns: I hope nobody gets hurt, and that the protests generate real action on poverty and inequality within the nation states these movements exist in, but without a genuinely internationalist and global platform, this is not for me. Sorry, but that’s where I am. Cheap polypropylene thermal underwear, two sets per person, with volunteer laundry services. And poly hats, too. You’ll need name tags for the laundry. Synergy beds: cheap inflatable camping mattress (the 1/2″ thick kind) under a cheap foam camping mat (the 1/2″ thick kind), with a cotton sleeping bag liner to absorb moisture, a decent synthetic sleeping bag, and over the top a Heatsheet-brand space blanket (accept no substitutes) weighted at the corners or taped to the foam mat. The foam mat is essential. The synergy bed is lightweight but utter luxury – feels like a 3″ mattress! Giant thermos flasks – 2.2 liters or more are cheap – and/or Jetboil stoves, which are incredibly efficient for keeping people warm by hot drinks. Corrugated plastic folding hexayurts, probably the 6′ Stretch hexayurt, which builds nicely in corrugated plastic. The big hexayurt is just too big for those materials. The bigger, heavier foam insulation units probably don’t have the right dynamics for the occupation, being rather big and hard to transport. But small folding ones, ftw. Use Simple Critical Infrastructure Maps (there’s a copy in the Gupta State Failure Management Archive to arrange meetings into Shelter, Supply and Safety quadrants, and learn how to use the naming scheme presented in that document to minimize or eliminate misunderstandings about infrastructure – it’s literally a series of agenda items for meetings, really, when you get right down to it! It’s a very simple, clean, efficient way to organize encampments and make sure everything gets done. But this is totally wrong. It’s a tactical approach to a fundamentally strategic and political problem: what to do with #occupy as winter approaches! I’m not saying there’s no value in Occupy Sustainability type appropriate technology solutions. I’m not saying that at all. But no set of kit can make your winter camps welcoming and hospitable and easy places of fellowship, not for long month-after-month occupations. So the problem must be considered at a strategic and political level. What I am saying is this: Avoid Winter War. Whether it’s Stalingrad or Valley Forge or the Talvisota, winter is not the friend of those involved in struggle. It might favor one side or another in terms of long term political outcomes, but both sides suffer, and the side with less support for dealing with the winter suffers doubly. So this is my advice on winter to #Occupy. Go #homeforthanksgiving. Declare victory, tell people you’ve held out long enough to make the point, and you’re going home to your families for the holidays. And then actually do it. Leave nothing behind but eerie silence. Clean up, Leave No Trace as they say at Burning Man, and then spend the winter getting your platform together and planning actions for the spring. Here’s my vision: in Spring, take-and-hold land and plant a hundred thousand wild flowers. In areas with bare earth, turn up with spades and grow food. Grow-occupy (#groccupy?) But work with the forces of nature, with the cycles of the earth, and cultivate a culture of growth, expansion, beauty and harmony. In winter, you will grow to hate each other, and the system. In the spring, you may see your way through to the universal love which changes all hearts, and into a culture of such beauty and nobility that nobody will crack your skulls for planting flowers and asking for change. In the spring, make peace through beauty. If you’re new to my work, this is who I am. YOU GO! TOTALLY AGREE with what you are saying! Really, if you want to stay in the outdoors in winter, you are asking for some serious logistics and money. IF you decide to hold ground, instead of working on the serious spring “Fling” then long underwear is not the way to go. I have deployed under those conditions, and , it aint pretty. Perhaps a full fun fur suit. Or look at a thing called Selkbag http://www.selkbagworld.com/ but you need serious shelter. If you stay, you will also need to look at your carbon footprint, increase your food intake 50 – 100% and have some really good medical attention. I think Vinay’s idea is the best, least distructive and more imaginative idea. Toss it in the general counsel and talk it over. The logistics are doable and the money is available if and only if a detente with the police can be organized. If that happens, it will be, in the end, no problem to keep occupations running. Many of the people in occupations are homeless. Many people gave up their homes to join the occupations. These people have nowhere else to go, and going home is leaving them alone in the street. They will stay regardless. If the movement splits in half, if will lose most of its momentum. If the movement somehow gives up and goes home, it will lose all of its momentum. There will be no spring war without a winter war. Their resolution to stay there is what gives them strength and growth. What if the few founders had just decided to stay for one day and leave at night because its “cold”? Would it have spread to as many cities and as many people as it has now? This protest runs on network effect. More people involved or knowing about it, the more people that will get involved in the future. Shutting occupy down for the winter would be like shutting Facebook down for the winter. Not a very good idea. The harshness of the cold will just give them more publicity which is what they need and want. Imagine news media showing them having Thanksgiving dinner and Christmas there. Even bad events, such as someone dying of hypothermia or losing fingers/toes due to frostbite would still, unfortunately but true, grow the movement. You can say they can still operate while totally off the streets, but their unmoving presence there is what made them strong in the first place. Momentum is everything. Disclaimer: I am not part of the occupy movement, thought it interests me greatly. I work for myself on the internet and am resourceful enough to always be able to find ways to make money and am not adversely affected by the economy or wall street. I don’t consider myself part of the 99% or the 1%. You could always stay inside and start filling out some resumes instead. This is very shrewd advice. But I think they have to leave with a very loud and obvious *promise* that they’ll be back. They can’t declare “Mission Accomplished”. Go to home? But some people does not have home!!! So where they should go? Under the bridges? I don’t see the issue of winter occupation as all or nothing. 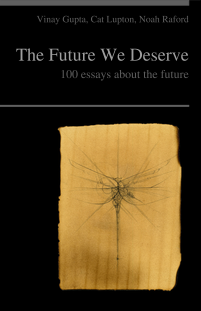 (Just as I acknowledge the currently-limited focus of #occupy, but see it as an important leverage point for ongoing education, awareness, expansion of movement into the existing value-channels of the Global Justice agenda). Occupation of physical space is important only in symbolic / motivational terms (as I argues here: http://steelweaver.tumblr.com/post/11367326021/location-location) – creating a real-world anchor, a public demonstration of effort and commitment and the breadth and quantity of the movement. - stop getting bigger, stabilise, and become part of the political furniture, losing some of their ability to act as symbolic catalyst / media magnet. - start getting smaller, at which point they will become a public symbol of the movement “failing” or “losing momentum” (which will not be true). Right now is a critical window in which the momentum of the movement can be used to build internal / non-physical infrastructure, communication, solidarity. All these things are bigger and more important and longer-lasting than the occupation of any particular urban space, just like (at least for some of the participants) #occupy is a physical manifestation of a continuous movement that has been growing and developing for the last couple of decades. - Continue to occupy those areas where it is possible: Wall Street definitely, maybe Oakland, maybe St Pauls; anywhere with a big symbolic value – concentrate some resources to keep them going through the winter (if necessary to avoid confrontation, shrink the size of the encampments to something the local authorities will put up with; a symbolic skeleton staff ‘bravely enduring the winter’ for the sake of the wider movement). - Simultaneously, disperse the wider population into a winter holding pattern: virtualise, moving some of the conversation / collaboration online (+ all those activists suddenly at home, online, writing 1000s of letters and emails a day to MPs, senators, media organisations., making sure they know the pressure isn’t going away); and localise, small physical (indoor!) meet-ups of local chapters of #occupy (cf. transition towns), building the movement, solidifying the knowledge, understanding, solidarity for the Spring. - Make occasional forays back into the urban ‘theatre’ with one-day pop-up Occupations in different locations throughout the winter; actually, this may even work better in PR terms, providing unexpected, sudden news-cycle events rather than the ‘same old’ pictures from Zuccotti park etc. ; also will probably really annoy/discomfort authorities by being an unpredictable flash-phenomenon. I agree, fighting a Winter War is dangerous, but they are right next to their lines of supply and there is little danger they will run out of money or resources to sustain themselves. As long as the public has a more or less favorable view of their aims, complaints and methods there is no reason they won’t survive the winter. Plus, on this side of the pond revolutionary movements have survived long winters before http://en.wikipedia.org/wiki/Valley_forge. My concerns with the Occupy movement are that the motivation for the movement stems from the fact that things are not the way that they were before 2008 and that what the Occupiers are demanding is essentially Barack Obama’s 2008 Presidential Platform. The sociologist Mike Davis asked: Can Barack Obama see the Grand Canyon? He means that when the first European explores came to the Grand Canyon, they were terrified, it was too big for them to comprehend and they ran away. A better question is, can the public see it? People are mistreating the economic crisis, its not a crisis, it is a collapse, things will never be the same, they can never be the same and it seems that the vast majority of people are unable to see to the bottom of the Grand Canyon and realize that they need to learn how to navigate the river in front of them and not run back to what they know in fear. Globalization and capitalism are unsustainable, there are not enough resources on Earth to fuel unlimited growth that supports this economic system. Aside from the fact that capitalism has found a way to make credit an unsustainable resource, so are things like copper and water. The still unfolding economic crisis, the unpredictable dangers of ecological stress, continuing major disasters relating to energy (ie BP Oil Spill and Japan Nuclear disaster; 1 a year is not a good average), geo-political conflict and dozens of other interconnected predicaments will continue to reduce societies’ resiliencies to crises until a tipping point is reached and natural selection takes over from there. Unless the Occupy movement results in large scale systemic changes that create a society that’s not based on consumption, it will do nothing but perpetuate the status quo. What the Occupy movement reflects is that society has no idea what they are dealing with or how to deal with it effectively, they are looking at the Grand Canyon for the first time, Aliens may as well have landed on Earth. Deep thinking – adds a new dmeniison to it all.